You know me as The Timid Rider, but there is a lot more to me than my experiences as an equestrian. While my love of horses is extremely important to me, it does not represent all aspects of my life. Nor should it. During a recent book tour, the publicist asked for 10 Fun Facts about me. I thought this was a fun way to share with a wider audience more information about me. And what better audience than my own readers? So, thank you for reading my blog and for wanting to learn a little more about me. 1. While I’m proud to call New Jersey my home, and I spent most of my life here in the Garden State, this is not where I was born. In fact, most people don’t realize this but I was born in California. My parents met at the Officer’s Club (my father was a Captain in the Air Force and my mother was an Army brat). They moved north to East Bay outside of San Francisco where I was born. I lived there a few years until my father was transferred for work to Washington State. I went to Kindergarten in Washington and then because the school cut off was different on the East Coast, I underwent Kindergarten again after moving to New Jersey. I was always officially the oldest kid in my classes. This served me well because I got my driver’s license first as well as reaching 21 before everyone else. I was raised primarily in New Jersey. I’m proud to be a Jersey Girl, and I do identify as such. I’m bold, sassy, and sometimes a little too unfiltered but in the very best of ways. If you have never been to New Jersey I promise you it is worth the trip and much more than the world acknowledges. 2.I got my first tattoo at the age of 36. My husband thought I was crazy, but it was something I’d been thinking about for years and I knew exactly what I wanted. It’s a Celtic Water Horse replicated for a pewter brooch I bought while traveling in Ireland in my 20’s. It is true what they say that tattoos are addictive because it wasn’t long before I got two more (at the same time) and surprised my husband with them. I’m currently debating which piece of art I would like to represent my journey in Mongolia for The Gobi Desert Cup. I’m a firm believer that tattoos are body art and should mean something to me, and not necessarily to anyone else. For that reason, I like to be able to see them. 3. I am an avid animal lover and have had a cat, dogs, and a pony! My dream would be to one day have a small farm but I don’t really think my husband is the farm type. Growing up, my mother had severe allergies and although I would find stray cats and animals, we were allowed only to have geckos, goldfish, and hermit crabs. Not exactly furry and fluffy, but as a baby, my family did have a beautiful German Shepherd Dog named Tasha. I’ve always had a soft spot for this breed because of her and my memories are vibrant right before she passed away from severe hip dysplasia. Here is a fun story that embarrasses my father immensely and has been told in my family countless times. While I was young and living in Washington State my father fell asleep while watching me and my younger sister. My sister and I wandered off as children tend to do, but we wandered into the street. Apparently, my beautiful dog set up a ruckus, alerting my mother in the house, and she ran out to find the dog dragging my sister and me onto the sidewalk by our clothing. To this day, I think of her whenever I see a GSD and smile. It is because of her I love big dogs and feel that they are a blessing. She was my mother’s first child, and I lament that I have only one photo of her and me somewhere in the recesses of my storage boxes. 4. I am a certified animal massage therapist. If you follow my blog at all or my business site, you are already aware. My day job is helping horses and dogs with sports massage to find and treat muscle spasms and areas of inflammation. I travel to barns and horse shows to work with horses, but with dogs, I see them in my Red Bank office, or if they are not ambulatory I perform in-home sessions. Every day is different. My schedule changes depending on each client’s need and I do travel sometimes long distances if there is a need for my services. I love my job. I not only provide immediate relief to animals but create a bond with them that cannot be replicated. I wish I could explain. The feeling of silent communication through touch gives me so much joy and is the reason that I will not use PEMF or electronic tools in my practice. Don’t get me wrong, I’m sure they have many benefits. However, I can feel the slightest change in the animal with my hands and body, and this is the reason that I am so effective as a certified sports massage therapist. 5. I am terrified of spiders. I respect them and their part in nature, don’t get me wrong. But I have literal sleepwalking nightmares about them. I love bats, will handle snakes with much happiness and have even spent ample time with rats and field mice, which I’ve been known to catch by hand because no one else would. But show me a spider and I’ll run the other way. FAST. And I hate running. I remember clearly as a teenager watching the movie Arachnaphobia for the first and only time. Never again. That evening I went to bed and when pushing back my sheets, a huge black spider ran out from underneath. The next morning while I showered, there was one on the showerhead which then landed on me while shampooing. That was an awkward encounter when I ran out of the bathroom half naked and full of soap screaming and asking my father to kill the spider! There were two more instances that day that I can’t even talk about with shuddering, and I’m convinced the movie brought the spiders to me. I’m superstitious like that. 6. The first time I rode a horse independently I panicked and jumped off before I even started the ride. It is a hilarious story that basically showcases why I am The Timid Rider today. 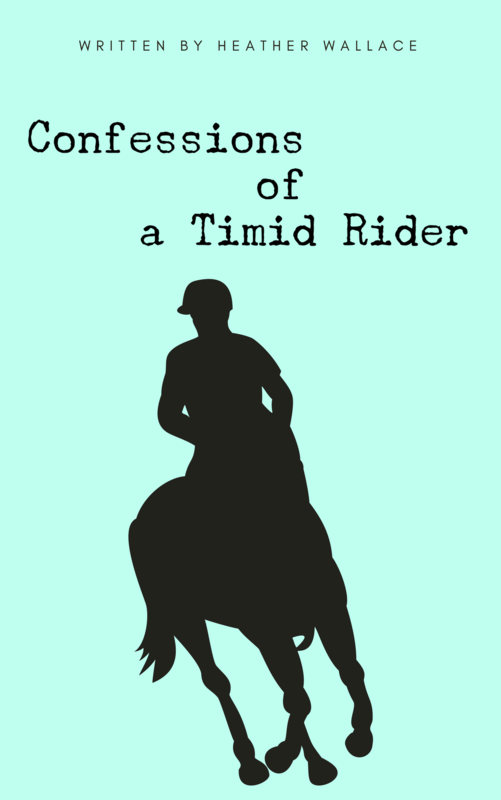 The details are not only in my bestselling book, Confessions of a Timid Rider but as a special surprise, I will publish later this week the FULL chapter for my readers as part of my First Horse Experience for the Equestrian BLOGTOBER posts. 7. I love to travel and as of August, I have been to four of the seven continents. My father was in the Air Force and growing up I flew all the time. My sister and I even flew by ourselves to meet my parents when I was about 9 or 10 years old. By the time I was in high school, I’d been to five European countries and we always went somewhere different. This year I went to Asia for the first time. My experience in Beijing, China airport was less than ideal however now I can say I’ve survived it. Mongolia was a whole other story. I underestimated how much of a life-changing experience it would be. Part of my job is to be on social media and in front of a computer. To be completely separate from the world for two weeks and experience a nomadic culture unchanged in many ways for thousands of years, was priceless. Now, I need to make it a mission to visit the remaining continents! 8. I love food. I’ve never been on a diet because I am too much of a hedonist when it comes to food. While I’ll dine at the finest restaurants in the world, my go-to comfort food is macaroni and cheese. Carbs don’t like me but I like them. After Mongolia where I had to stop snacking and drink more water than anything else, I’m really trying to make healthy choices. I will never deprive myself or force myself to be hungry, but I do need to drink more water. 9. I am more graceful on a horse than I am on the ground. I’m a huge clutz and have been known to walk into parking meters, doors, and slide down steps on a regular basis. That being said, I absolutely love to dance and happen to think I’m pretty good at it. And if I’m not good at it, I don’t really care. I dance like I wish I rode a horse- with complete confidence and like no one else is looking! 10. I read tarot cards. I’m not sure how good I am at it, but I have never been steered wrong yet! My mother likes to say I come from Gypsy ancestry, and my father’s family is from Bohemia with strong ties to the Romani. I am superstitious, believe in the power of energy affecting others, read tarot cards, and have an affinity for horses. However, I do not like to subscribe to stereotypes and am definitely not a thief. I hope you learned a few fun facts that you didn’t previously know about me. I’d love to have you comment below with one fun fact about you!